Her teacher, Mrs D retired today, so it was a doubly poignant ‘last day’. I knew that Mrs D would get loads of flowers and chocolates as thank you presents, so I wanted to make her something myself. What I chose to make were highly impractical creations, and I like them all the more for that! 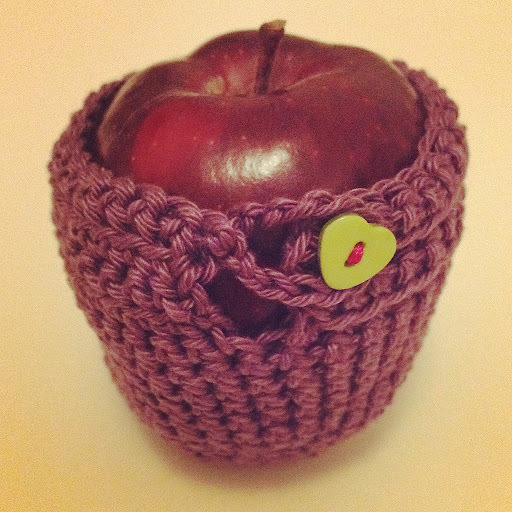 For ages I’ve wanted to crochet an apple cosy, designed by the über-talented Sara Sinaguglia. Sara also lives in Dorset, so not too far from me, so it felt good to make something that had also been designed in Dorset too. Her blog is gorgeous – go check it out! I first saw Sara’s cute apple cosy on the cover of the inaugural issue of Mollie Makes, a fabulous magazine for people who like to make, thrift, craft, design and basically revel in gorgeous things. Mrs D seemed like the ideal person to make an apple cosy for, with a real ‘apple for the teacher’ inside. So I used a gorgeous purple yarn and hooked my way to a cute cosy – job done! I finished it off with a cute green heart button from the wooden knitting needle lady at Dorchester Market. 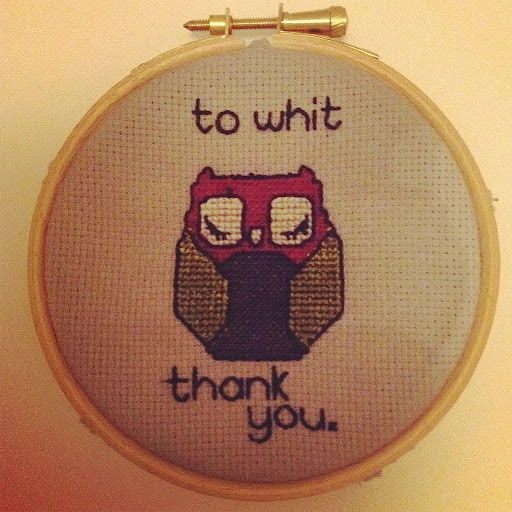 I saw a little owl on a thank you card and used him as my inspiration for a cross-stitch owl. (Does anyone else find cross-stitch ever-so-slightly addictive?). I’m really pleased with how he turned out! Both presents were packaged together in a paper bag, embellished by the Moo. Fabulous, heart-felt, and home-made – what could be better? Thank you Mrs D, you’ve been a dedicated, enthusiastic and patient (!) teacher. The apple cosy is very cute, I'm sure the teacher was delighted with it.